The Diary of Nicola-Kim: Is it just me? Is it just me or do others also battle with the noise level in their house? My 3 children (all boys) are 13 going on 14, 12 going on 112 and 9 going on 3 years. They make enough noise of 20 hyenas and 10 buffalo combined. I am tired. And I am sick. Really, I have had this damn cold now for about a week, my head feels like it has a percussion concert going on inside and the children and Mister Husband are not helping. It's Oldest being silly, counting his pubic hairs and Middle and Youngest shouting at him to "put that disgusting thing away! ", it's Middle teasing Youngest about what he eats, it's Youngest shouting "Leave me alone! ", it's Husband reprimanding and dishing out punishment, it's all three of them begging and pleading to have said punishment removed, it's Husband shouting for everyone to be quiet. And this all with the T.V on in the background! I feel like I am being assaulted by it all. I want to put my sinus-sore head down and weep with the pain of it all! I can't bear it and I just wish they would all SHUT UP! I fantasise of having my own place. A small hideaway at a place like Pittenweem or Anstruther. A place that no one knows about except me. A place so quiet you can hear yourself think. Actually I would take a place just about anywhere if I could just have some quiet! I remember watching Date Night and in this one part the husband asks the wife if she ever fantasised about running away with someone else and she says all she fantasises about is being in a hotel room on her own drinking a diet Coke in peace. I so relate. Although I would skip the diet coke and go straight to the wine. Or something stronger. Anyway - on the up side - I am reading a great book. 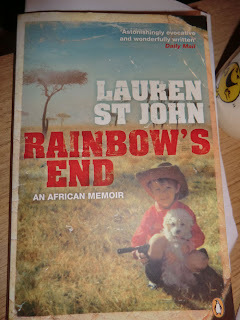 Rainbow's End by Lauren St John. It's an African memoir, loaned to me by Eldest's lovely English teacher that I met at parent evening. I am loving the book! I love stories of Africa. I miss Africa. There was a time I was afraid to say that out loud. I miss Africa and I miss the African people. I totally agree, Nicola. The nostalgia for Africa. I was even lus for Iwiza Number One the other day. I am going to have to put in an order at the South African shop - Iwiza, cream soda, chutney, Pronutro... It helps keep the homesickness at bay. Happy to hear that you're able to escape into a book at least some of the time but I sympathise with your noise problem. I'm not sure how I'd manage in that situation - is there anywhere you could go off to for an hour or two? The library? A coffee shop? It sounds like you need a break from everyone. Oh, I do need a break, Kath. And part of the problem of not getting out of the house is my own fault, because I'm a bit at the stage of 'if the house isn't burning down, why leave?' I need to get out more. You are right. We can do a Thelma & Louise? Sod Thelma and Louise. I recommend eating and drinking instead of driving over a cliff!